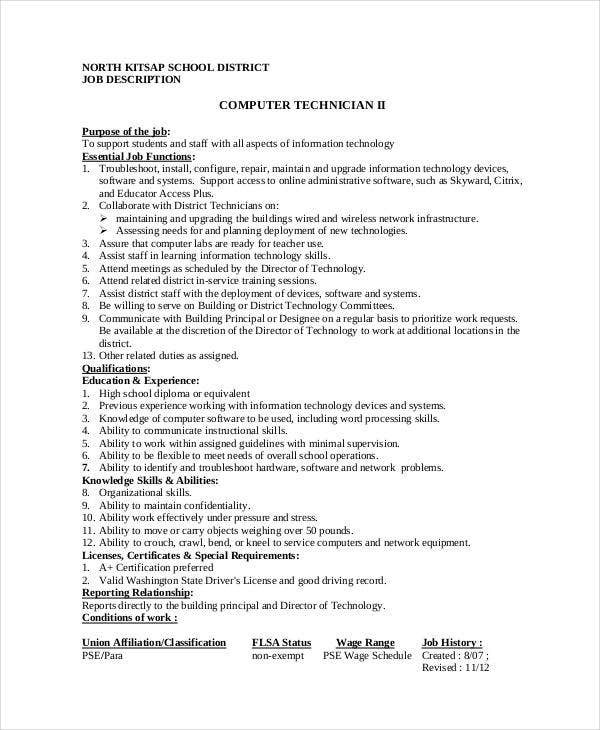 Most jobs nowadays involve the use of computers to some extent. 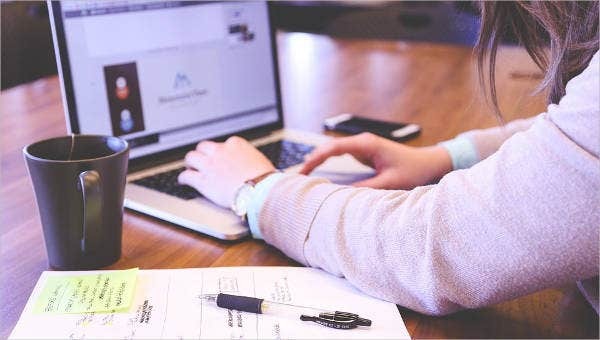 Employers would usually include in the their list of requirements that the applicant has even a small background and knowledge in the use of computers. We are in the generation that we rely on computers to become productive in our daily activities. Without computers, people nowadays would have to resort to more primitive means of accomplishing their tasks, and this would cause a decrease in productivity. But not everybody knows how to troubleshoot computers. Some people may be good at programming but have no knowledge in the different hardware peripherals, while some may also be knowledgeable in the part of a computer but do not know how to manage computers using programs and applications. And that’s where computer technicians come in. 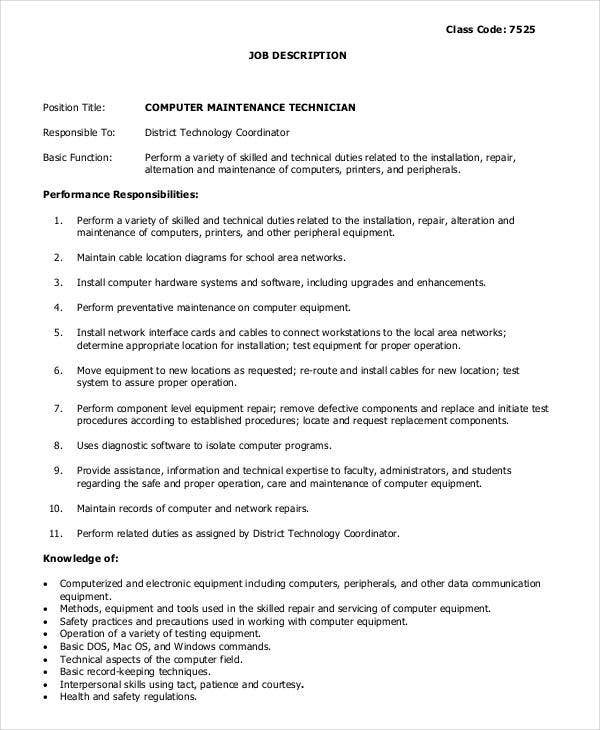 They are personnel tasked to maintain and repair the computers when the need arises. 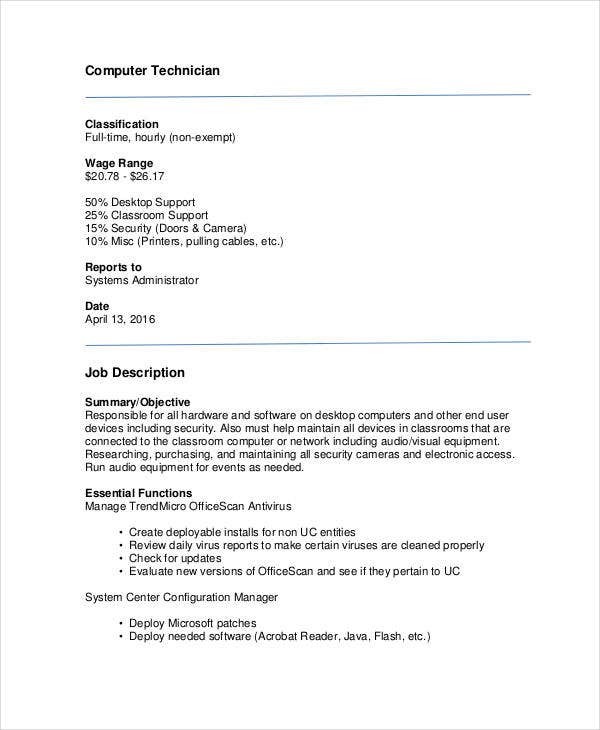 So we have provided you with Job Description Samples to provide for your computer technicians. A job description is a document that identifies the different roles and responsibilities of a particular job. It often includes the employee’s relationship with coworkers and other people in the organization, and it specifies the person whom the employee reports to. A job description may even include the skills a worker must possess in order to be qualified for that position. 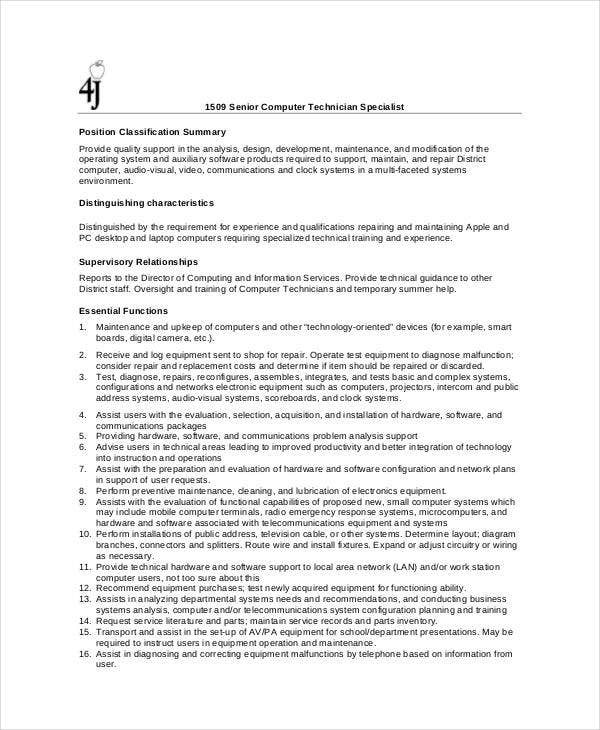 Also, a job description may include the salary amount for that particular position. With computer technicians, their primary role in a company deals with everything involving the computer and its peripherals, as well as the network. They are tasked with maintaining and repairing computers, including the installation of new software and hardware. Aside from the computer itself, computer technicians also deal with the server and the entire network if problems arise involving the Internet connection. 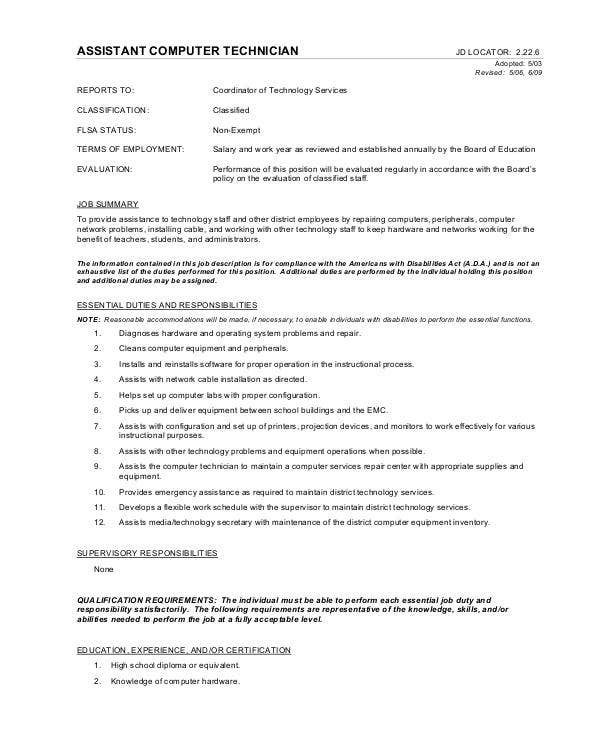 For other job description templates, check out Graphic Designer Job Description and Software Engineer Job Description. 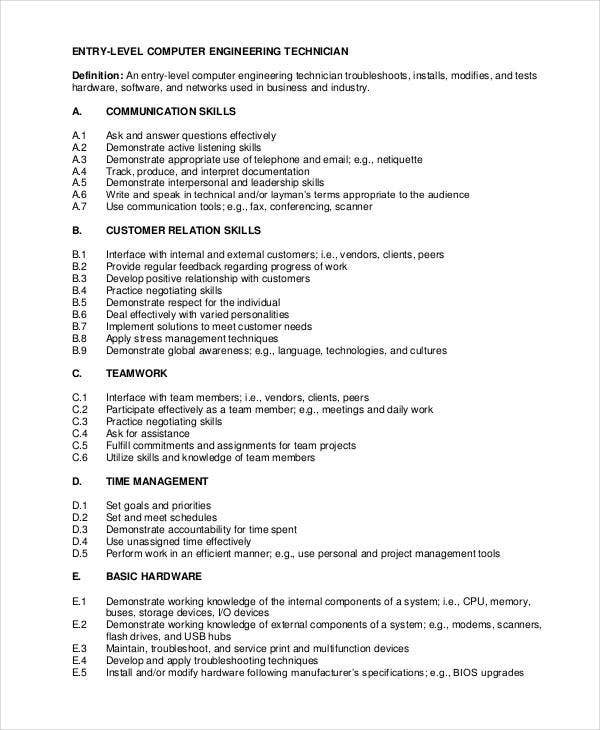 If you are a Human Resource Manager or are simply tasked in the recruitment and management of employees, and you are looking forward to writing a job description for your computer technicians, then you are in the right place. We have a great selection of job description templates ready for download. 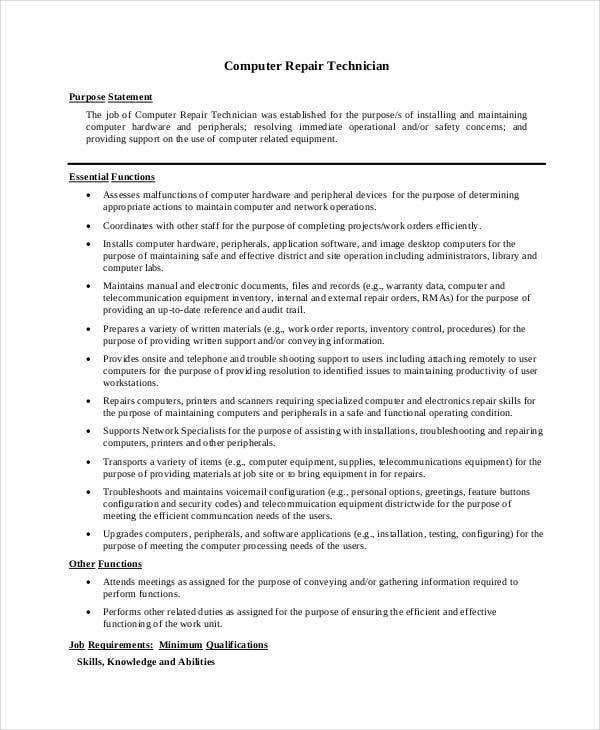 Our templates range from job descriptions for trainees to job descriptions for computer support. 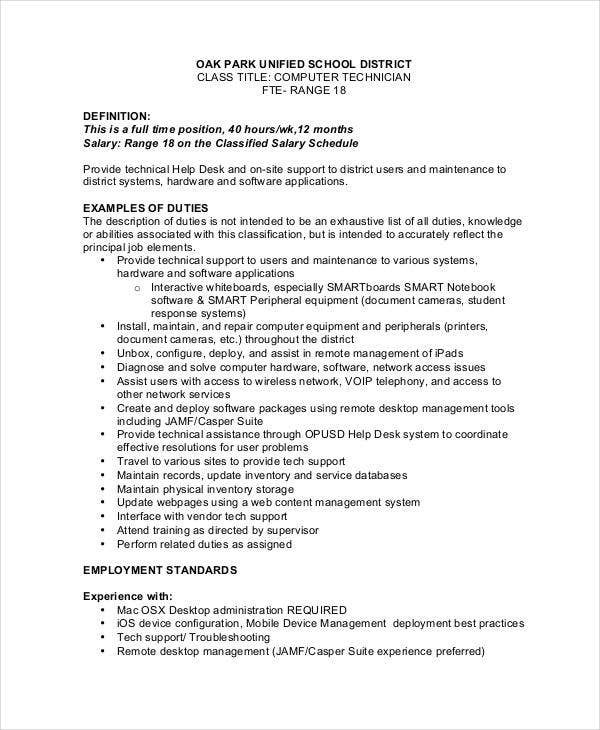 We made job description templates to suit client’s demands and are appropriate for any computer technician. You may also see Graphic Designer Job Description Templates. Our job description templates come in high-resolution PDF format to assure you of legible prints. You may be able to access and download any of these templates for free onto your personal computer. These templates are fully editable, which means that you won’t have to worry about writing it all over again on a separate sheet. 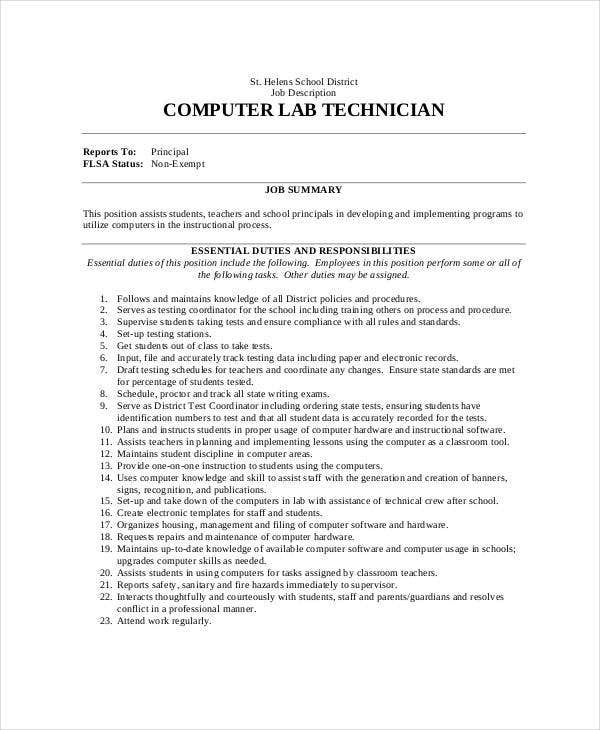 Now that we have saved you all the hassle, you can now start making your own job description for your computer technicians. 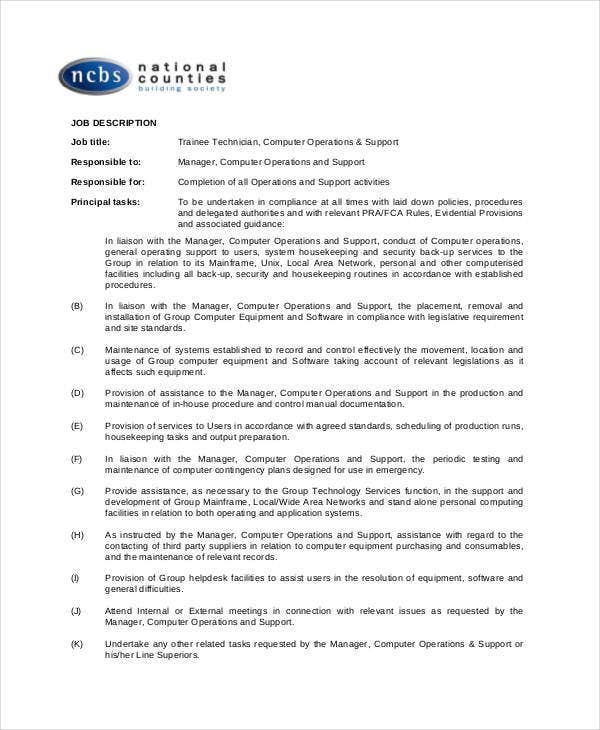 If you are looking for job description templates that identify the roles and responsibilities of COOs, then refer to Chief Operating Officer Job Description.